Kids don’t really care how or where a toy is made—they just care if it’s fun to play with. 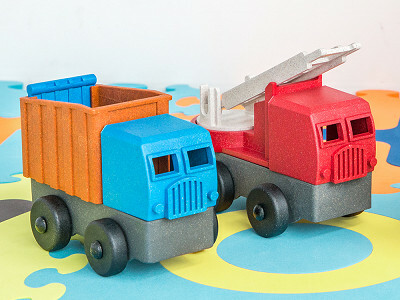 Luckily, the eco-friendly toy trucks from Luke’s Toy Factory are fun . . . as well as safe and Made in the USA. 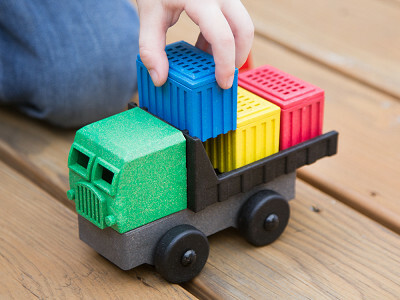 The innovative modular design lets all the parts of each truck fit with the others. They’re rugged, too. 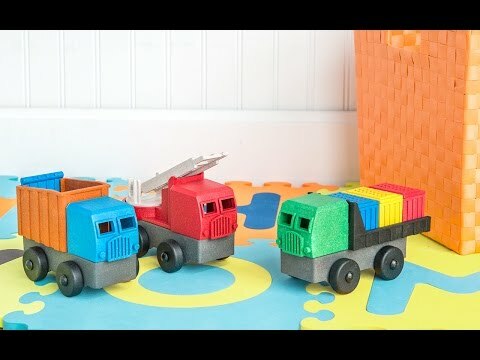 Luke’s toy trucks are made of sawdust left over from furniture manufacturing. 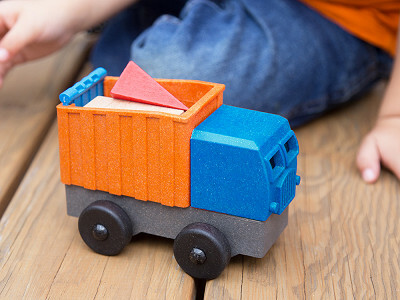 It’s combined with organic materials and safe, certified plastic polymers to create a sturdy material that has the look and feel of vintage wooden toys. 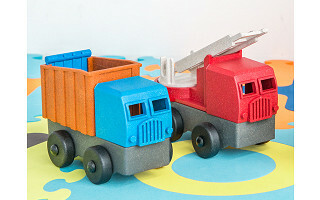 Luke’s trucks are also safety tested and three times thicker than comparable plastic toys, as well as BPA- and paint-free. 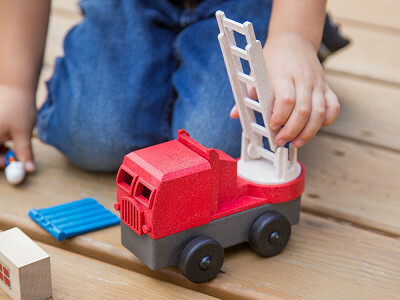 After seeing all of the toy recalls in the news, Founder Luke Barber and his dad were inspired to produce environmentally friendly toys in the USA. In fact, every step of their production process happens right here in the States. Kids will like the bright colors and interchangeable design. Meanwhile, you’ll like supporting American ingenuity and manufacturing. Hello everyone! I'm proud to introduce Luke's Toy Factory to The Grommet. I'd be happy to answer any questions you have! Why are they for 3 yrs and older? Hi Jerry, I'll let Luke confirm, but I believe it is due to the smaller pieces included. They could be a choking hazard. 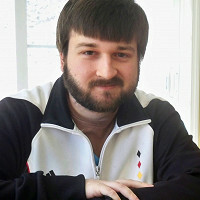 @Mike Hi, this is Luke. It's not because of the small parts, it's because it's somewhat complex for a 2-year-old. The CPSC Age Determination Guidelines suggest that a toy this complex should be 3+. None of the parts are smaller than a choke tube. Well there you have it, Jerry! Hi Janet, they are all about 6.25" x 3.5" x 5". Great job. Reminds mew of the toys when I was a kid. @Sue Thanks! That's what we were going for, a timeless look. Congratulation and Thank you , Wishing you best success . You need to protect your work from copy which are bound to happen , Art has a permanent copyright .... food for thought . @Joel Thanks for the advice. We currently have a trademark and a provisional patent on the designs. I entered 1 each of the 3 Luke's Toy trucks for a total of 3, but they listed at regular price, not $20 each, so I did not purchase. How can I get the $30 each price for purchasing 3? It should be all set, Paula! You just have to go towards the end of the checkout process to see it! I meant how can I get the $20 each price for purchasing 3? Hello, I also tried to purchase 1 each of the three trucks but the price did not change to $20 each. Is there a coupon or is it adjusted before I order? Hi Kathi, you will see the discount towards the end of your order! Awesome! I will be ordering these for my grandson for Christmas!!! @Kathy And we will be ordering these for our granddaughter to use in her sandbox on the deck. She will have a good time. Sounds like a lot of happy kids this holiday season! I am delighted to find these on all points-using manufacturing waste, made in the USA, etc, etc.! Thanks so much for the kind words, S! We, too, were delighted at how Luke's Toy Factory operates sustainably in the US. If you go all the way to the end of the checkout process (before processing) you should see the discount! @Mike , I got all the way to the "purchase" button - credit card & shipping entered and nothing changed. There is no adjustment on my end. Hi Kathi, hmm that is odd. I just tried it and it worked. I would give it the ol' reboot. Remove the items from your cart and try putting them in again. You should see the discounts on the right hand side after you click "Checkout" in your cart. Let us know if you continue to have problems! Hi Luke, What do you use for the various colors of the toys? @Alice We use FDA-approved dye pellets during the injection molding process. hat happens if they get wet? @judy Nothing; they're waterproof. The only thing I would recommend is to dry them with a towel or air-dry them; we haven't tested them in a dishwasher yet. You wrote no part is smaller than a choke tube. I presume that they'd be safe in a household that includes a 6-month old? @Niesa There's nothing in the toy that would be unsafe for a 6-month old, but a parent should always exercise caution. My younger brother was always trying to play with my toys when I was younger, so I know what that situation can be like!